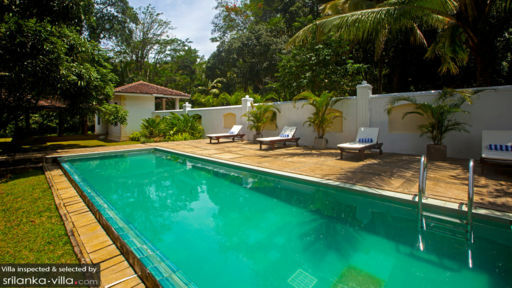 Excellent facilities including spa, swimming pool, TV lounge, etc. 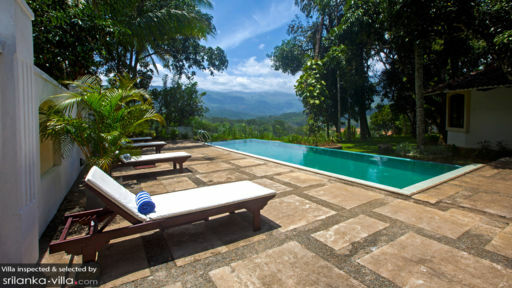 Snug amidst a hilly valley in Sri Lanka’s Kotmale Valley, Mas Villa by FOX Resorts is a splendid property with naturally-abundant views. With a choice of deluxe rooms, master suite, and premier deluxe rooms, guests have the luxury of choosing one room or the entire villa as per their preference. Five-star amenities including restaurant, private pool, spa facilities, and badminton court are available for use by guests of the villa. For a memorable holiday with loved ones, the serene location of Mas Villa is the ideal way to commence your Sri Lankan adventure! The manor house has seven bedrooms - deluxe, premier deluxe, and master suite - and it is up to you whichever you choose. There are several facilities available and the view from the suite and dining terrace is worth every penny. Four deluxe bedroom with king- or queen-sized beds are available for booking and they have tea/coffee making facilities as well as en-suite bathrooms with showers! The two premier deluxe bedrooms offer absolute luxury with king-sized beds, 32" flat-screen TVs, showers and bathtubs in the en-suite bathrooms, and minibars. The master suite is the most spacious of all, taking up the first floor that provides a great vantage point for the most enchanting view of the hills. The bedroom features colonial interiors, a comfortable king-sized bed, 32" satellite TV and an en-suite bathroom with a Jacuzzi and shower. The 250-year old manor house has been converted into a holiday home however, the old-world charm and rustic elegance is still present in the very walls of Mas Villa. Wooden columns marking the entrance to the home, manicured lawns stand sprawling in front, and lotus ponds only add to the luxurious experience. With a private swimming pool, guests are free to indulge in a swim or splash with friends and family. There is a full-blown badminton court as well, so you can challenge each other to impromptu matches! The corridor leading up to the bedrooms at Mas Villa is furnished with comfortable settees and ancient sofas done up in jewel-toned upholstery. As you turn your gaze around the hilly areas, a sense of calm drowns you in slumber and you are left feeling utterly refreshed. 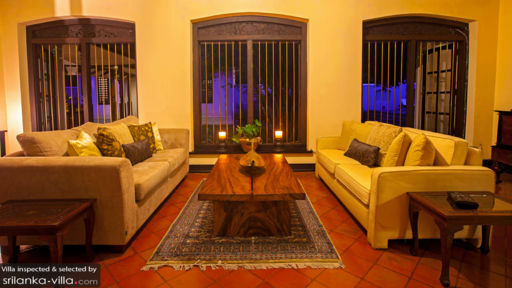 Lounge on the wooden chairs as you enjoy views of the garden that is awash with tropical greenery. A pool table and a TV lounge are accessible to guests for entertainment and recreational purposes. A library lined with bestsellers and a DVD player with an oscar-worthy collection are all present for your use! Dining is a serious affair at Mas Villa, and you can choose to dine in the privacy of your personal bedrooms or venture out to the stunning dining area on the villa’s verandah with a large dining table for guests. The Villa team will also be happy to arrange dining in the garden. Amidst the hills, with an enviable view and cool, fresh air, dining in candle-light is a sure experience that will make you endlessly happy. The house cooks are happy to serve you with meals prepared from organic, homegrown ingredients! Apart from the many amenities offered by the villa including badminton, a pool table, mountain biking equipment and TV lounge to name a few, the friendly staff makes it even better with their generous services. There are on-request laundry services available to guests, in-house massages, and personalised dining services if required. The staff can also arrange cookery lessons, guided tours of the gardens where you will see many wild animals and exotic flora & fauna, or even a trek of the village and paddy fields. From the personalised and well-catered to experience at Mas Villa, guests can even explore the surroundings with their help. The staff can provide equipment and transport or you can explore the valley and visit nearby Kandy Town and Nuwara Eliya. The village of Kotmale has much to see including Kotmale Dam and Power station, Kotmale hanging bridge, and Dunsinane Falls!